This week’s American Idol elimination was not only disappointing for Sam Woolf but also for the legions of teen girls across America who’ve been screaming for him since his audition. The 17-year-old was coined this generation’s Ricky Nelson by Harry Connick Jr., but the Bradenton, Florida teen is more than just a pretty face. He’s been singing and performing ever since he can remember and was known to give concerts on his high school’s courtyard. The singer also writes his own music and even got to perform one of his original pieces on the Idol stage. Before Idol, he was just another student at Braden River High, but he probably won’t be able to quietly walk through the halls anymore. His hometown cheered for him loudly and held weekly viewing parties. “The support means so much,” he shares. “I don’t think I would’ve made it this far without it.” Although he was far from home, Woolf didn’t forget about his schooling. He continued his studies in Los Angeles with the help of a tutor. Unfortunately, he won’t be able to make it to prom but hopes to still walk with his classmates during graduation. Woolf takes his elimination in stride. “I wasn’t really surprised that the votes weren’t unanimous. I think we should’ve just stuck with the original format of one person leaving every week.” He even tweeted to his fans to not get angry at the contestants who voted yes to somebody going home this week. 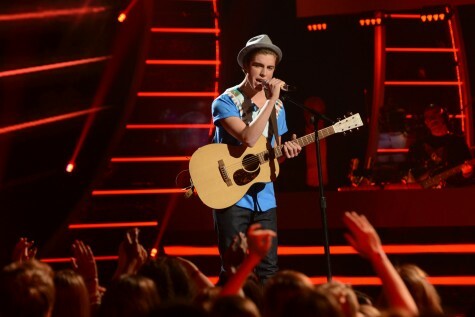 You can still catch Sam Woolf on the American Idol summer tour! Until then, keep up with him on Twitter @samwoolfmusic.